Καλοτοποθετημένο στη εστιατόρια, νυχτερινή διασκέδαση, ψώνια περιοχή της Μπανγκόκ πόλης, το Glur Watergate Bangkok είναι το κατάλληλο μέρος για να χαλαρώσετε από τις πολυάσχολες μέρες σας. Μόνο 40 KM μακριά, αυτό το 2.5 αστέρων ξενοδοχείο είναι εύκολα προσβάσιμο από το αεροδρόμιο. Με την βολική του τοποθεσία, το ξενοδοχείο προσφέρει εύκολη πρόσβαση στους προορισμούς της πόλης που πρέπει οπωσδήποτε να δείτε. Στο Glur Watergate Bangkok, η άψογη εξυπηρέτηση και οι ανώτερες εγκαταστάσεις συντελούν ώστε η διαμονή εκεί να σας μείνει αξέχαστη. Το ξενοδοχείο σας προσφέρει μια μεγάλη επιλογή υπηρεσιών, συμπεριλαμβανομένων των δωρεάν WiFi σε όλα τα δωμάτια, ημερήσιος καθαρισμός, 24ωρη ρεσεψιόν, φύλαξη αποσκευών, ασύρματη σύνδεση Wi-Fi σε δημόσιους χώρους. Η ατμόσφαιρα του Glur Watergate Bangkok αντανακλάται σε κάθε δωμάτιο. Στην ιδιοκτησία θα βρείτε ασύρματη σύνδεση internet (δωρεάν), κλιματισμός, γραφείο, στεγνωτήρας μαλλιών, κοινόχρηστο μπάνιο, καθώς και πολλά άλλα. Εξάλλου, το ξενοδοχείο διοργανώνει πολλά ψυχαγωγικά δρώμενα έτσι ώστε να έχετε πολλά πράγματα να κάνετε κατά τη διαμονή σας. Με την ιδανική του τοποθεσία και τις καταπληκτικές του υπηρεσίες, το Glur Watergate Bangkok θα σας ευχαριστήσει σε πολλά πράγματα. Air conditioning is only available between 07:00 PM and 10:00 AM. Everybody was helpful--from the receptionist to the housekeeping staff. This is also very close to the shopping district which makes it very ideal to people like myself who loves to shop in Bangkok. The rooms were very clean and nice, we have free breakfast every single day and the every nook and cranny is Instagram worthy. Located near Pratunam Market, the hostel offer lots of nearby attraction to us. As a first timer to Bangkok, we really enjoyed our visit and stay. It was near to Pratunam market but not in the crowded area so we can sleep tight while also have a walking distance access to pratunam market and nearby public transportation. Easy access from airport and the staff also very very friendly and helpful! Definitely would recommend to others! I didnt stay long, just came to sleep. Everything was nice! although alittle crowded, very little space from door to the bed. The place was beaufitul! although could get a little noisy in the common arear because the place is nearby a market and an intersection, but the rooms/containers were quite quiet. Everything is well except alittle too hot in the common area. This place is value for money. We really enjoyed our stay here, even though the rooms were small (we had 2 big luggages so there was not much room left at all). The room, toilet, and public areas were clean. The AC and hot water worked properly. Breakfast was good as well. Location is very good for this hostel. It's about a 600-meter walk to Platinum Fashion Mall and there's plenty of street food and convenience stores around the area. They also have luggage storage for guests and it's free for the first 7 days and you can pay if you want to store your things longer. Just make sure to bring your own lock but in case you forget, they have locks for sale. If you are just looking for a place to crash after exploring and shopping around Bangkok throughout the day, then this is the place for you! We stayed here during our 4 nights Bangkok trip in July. It was a very satisfying stay. We took the train from airport and stopped not too far from the hostel. It took about 10 - 15 minutes walk from the train stop (I forgot the name). The interior was very cute and the room was also simple and clean. We were welcomed by friendly and helpful staffs. It was very close to Pratunam market, Platinum shopping center, and there's a lot of local food stall in walking distance. The closes transportation was to the Pratunam Pier, which could take us to almost anywhere with low cost. It was more efficient than took the train because of the 10-15 minute walk to the nearest train station. Overall, we have a super satisfying stay and would super consider to come back if we're coming to Bangkok next time. Thank you Glur Watergate! First time I stay here for 4 nights, just next to 7 eleven, 7 minute walking distance to chit lom bts station,very friendly staff can speak Chinese,and also good wifi connection,next visit i will come back stay again. 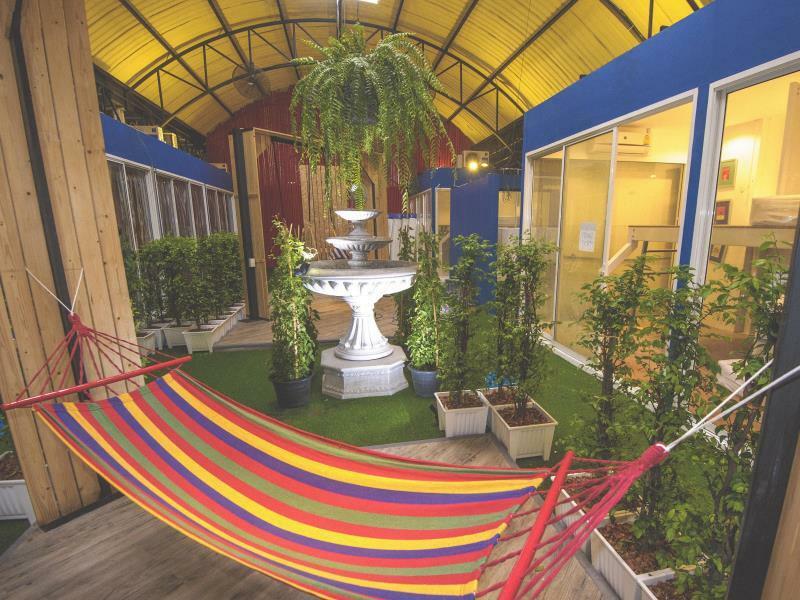 Extraordinary for a backpack hostel. Really recommended. Really kind staff, they feel so happy to help us. free lemon water and snack, wonderful interior, a cafe inside the hostel and great breakfast. And its cheap!! Its just 10 minutes walk from the nearest BTS (skytrain). 5 minutes from water transportation (to khaosan street) Really worthed. This is the best place that i stay when i was in thailand. Near the bts (10 minutes walk) near the water transportation (5 minutes walk) (this transportation to reach khaosan street). Near a market, mall, and food stall. They give you an infuse water (lemon and mint) water, and snack. The staff was verry kind. They can help you so much. They can speak english (its hard for me to find someone who speak english in bangkok) i recommend this place. Its totally worthed. I really enjoyed my time at Glur Watergate. The place is quite new so google maps can't find it yet. So if you are taking taxi, better call Glur Watergate and let them explain the place to the taxi driver. The rooms are quite small but the beds were so nice and clean. Wifi unfortunately was not working. The best part of Glur Watergate is the front desk staff. They are really helpfull. Helping me finding taxi. Finding taxi in Bangkok is quite annoying, a lot of them don't speak english and a lot of them don't want to use meter. Chitlom BTS Station is about 10 - 15 minutes walk, so if you're carrying a lot of stuff better use taxi. Platinum and Pratunam are about 5-10 minutes walk too. It's about 25 minutes walk to the shopping centres including Central World, MBK and Siam Centre. 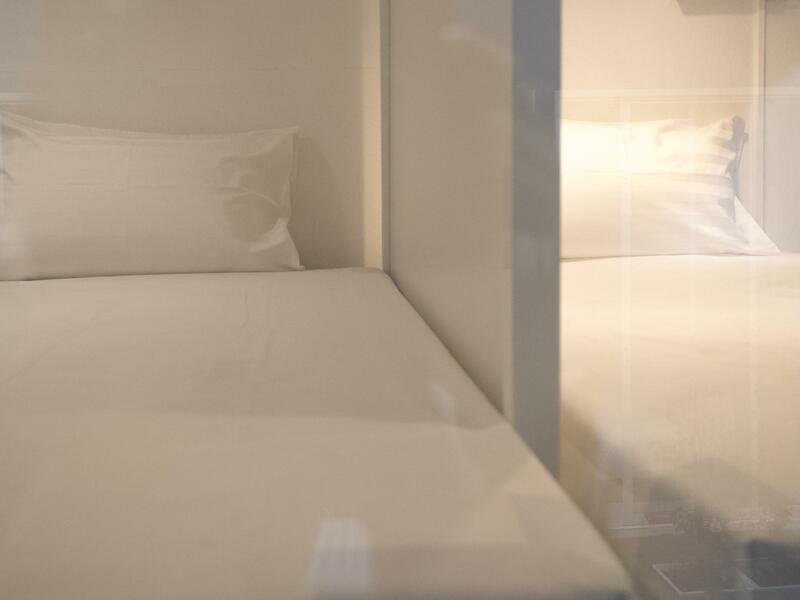 Beds are in comfortable little pods and private rooms are available. Water too small for shower and hot water sometimes don't have. I've stayed at numerous hostels in Bangkok. So far, this one is my favorite for numerous reasons. 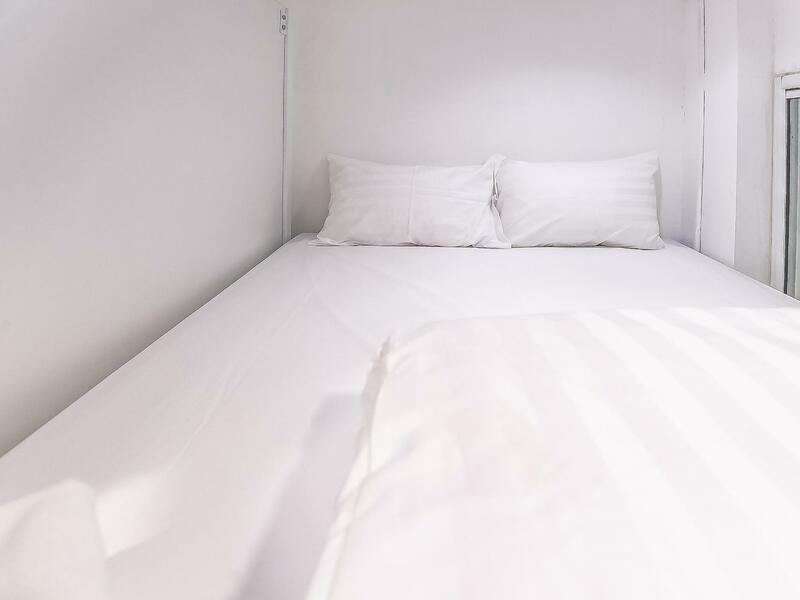 The pod beds are private and so comfortable. The bathroom is clean and the showers are hot. The breakfast is filling and the drinks are delicious. The staff are so friendly and helpful. Best of all, the place looks awesome! The only disadvantage is construction sounds next door starting around 8 AM, but that's no fault of the hostel, and verily a problem throughout Bangkok. I've already invited several other friends to stay there, and I'll be back myself. Highly recommended! If you want to go shopping in Siam this is the perfect place. It's about 25 minutes walk to the shopping centres including Central World, MBK and Siam Centre. 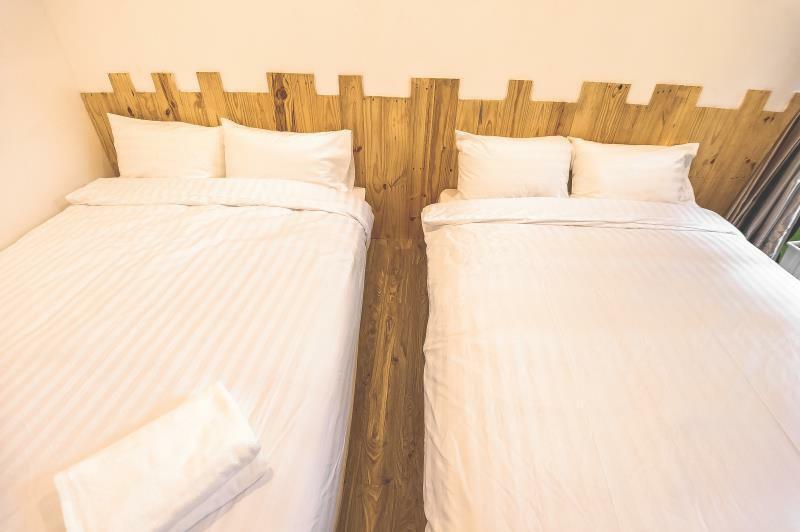 Beds are in comfortable little pods and private rooms are available. Bathrooms are clean although the shower wasn't great. The cafe/bar has a nice selection of drinks. This hostel is near by skytrain, bus stop, BTS and MRT. Good to transfer to others place. We can walk to Big C supermarket, Pratunam Market, Centrer World shopping mall wihtin 10mins. This place is good for whose want to shopping. Very good mattress, sheets, and blanket. Good location. The drains of the showers get clogged and the showers flood in the evening. It would be good if evening housekeeping or staff monitor the bathrooms. Pros: walking distance to major shopping mall and pratunam market, good service and friendly staff. beautiful garden. Cons: the common area (garden?) is too warm to hang out. if there is aircon it would be much better. Too little toilets (2 toilet 3 bathroom per gender) to satisfy the demands. also there might be insects biting you at night. better if they install insect repellant inside. Side note: Also it's 15 to 20 minute walk to Chit Lom BTS. 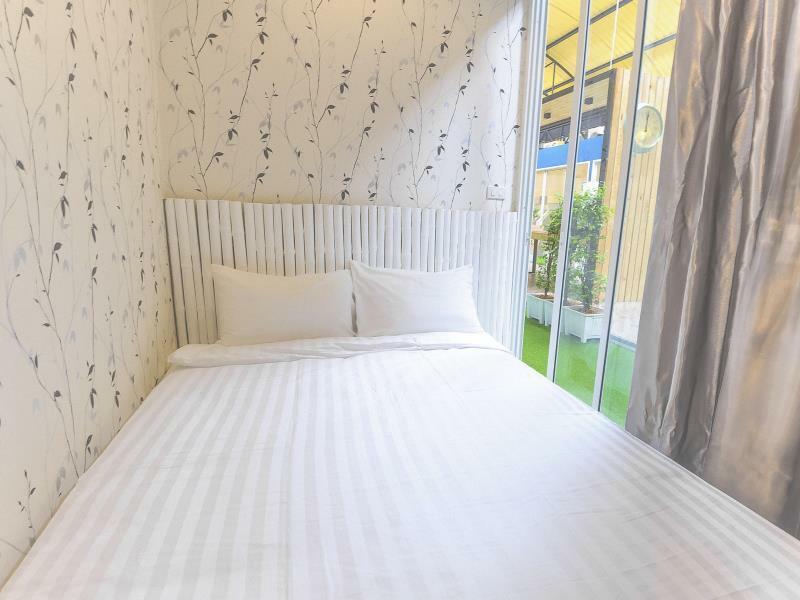 Very convenient stay, near big malls in Bangkok (Central World, Big C, Pratunam market, Siam Square, MBK, Platinum...). Great place if you want to enjoy shopping. Staffs were friendly, they can support us all day. I will stay here again if I come back Bangkok!!! I had a trip to BKk with my friends. It was so lucky for me because I choose Glur. The staff here is so nice and friendly. I like everything here: welcome drink, free water and snack, free locker,... Reception is a coffee shop. It's so nice :) Thanks Glur @@ Easy to go to shopping central at BKK, just 2 mins walking, easy to go to Chidlom BTS or Siam BTS. Near delicious street foods or food centre... You should try the noodle beside this hostel (delicious and cheap) I have some suggestions for Glur: you should invest some equipment to do execise for men such as dumb-bell,... Prepare some back up towels ^^ I will come back if I visit BKK again! Σταθμός BTS Chit Lom στα 0.62 χλμ.